When the Holy Roman Empire of German Nation ended under the pressure of Napoleonic France in 1804, Emperor Franz II resigned and started his own, Austrian Empire as Franz I. A long time after the Empire had ended, one of Austria′s most popular skiers gave cause to cheer like nobody since the last Emperor had done and thus, he was nicknamed Emperor - "Kaiser" Franz Klammer. 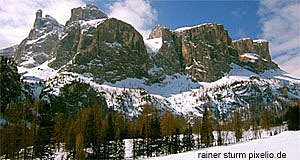 Born in 1953, he grew up in a humble environment in a Carinthian village called Mooswald, rather far from skiing areas. As a child, he used to hike up the local hills to ski. He did not start to ski seriously until he was 14, but once he did, his talent soon became obvious. In 1974, he became second in the World Championship. In the years before, he had been trained vigorously by Karl Kahr specifically on the discipline of downhill skiing. This would stay Franz Klammer′s speciality. At the Olympic Games of 1976 in Innsbruck (which were started with Klammer carrying the flag of Austria at the opening ceremony), he won the downhill competition. One year later, his brother had a skiing accident and is paralysed every since - the reason why Franz Klammer chairs a charity foundation that supports young sportspeople that suffer from injuries. In the following years, Franz Klammer did not only become a national icon to Austria, but also the most successful downhill skier in history. A total of 26 victories in World Cup races, of which 25 were in downhill competitions and eight downhill victories in the World Cup series of 1974/75 alone created a legend. In 1979, he got married - professionally, however, troublesome times started. For several years, Franz Klammer tried to go back into his original shape, but failed to continue his career at the same pace as he had in the 1970ies. His struggle became the dominating issue in Austria′s media coverage of ski sporting events and there was wide solidarity. A final comeback eventually worked at Val d′Isere, where Franz Klammer won a World Cup race in 1981. Even formula-1 legend Nicki Lauda publicly announced that he had cried tears of joy after the victory. Klammer also attended the Olympic Games of 1984 in Sarajewo, but did not do very well. One year later, in 1985, Klammer retired from skiing and started a short, but fairly successful career as a car racing driver. He continued to ski occasionally, is active in the organisation of the Olympic Games and the World Sports Award in Monte Carlo. He is active for the United Nations, does - still - a lot of advertising that finances his passion for playing golf and is a very present figure in Austria′s high society. His experience in the skiing industry helped him to take several positions in the business world of Vienna, where he lives today.